Welcome to the sixteenth and final post in the Sustainable Energy without the Hot Air – A New Zealand Perspective series. How much could we increase our energy generation capacity in renewable sources? How much could we achieve a BIG reduction in our personal and national energy consumption, and where those savings would come from. We went through the areas of energy use for Kiwis, including road, air transport, home energy use and general consumption before doing some calculations on the overall reductions we think we could make. What might it cost to achieve an all-renewable energy economy? Today, we’re looking at how this might translate into action at a national level. This post contains both some costing, and suggestions for action that might effectively be channeled into effective change. Sustainable Energy NZ #15: Keeping it lean and mean – a summary of energy use. How can we achieve a BIG reduction in our personal and national energy consumption? Remember, as before, the units are in kWh/day/person – ie. if you ran a 40W lightbulb for 24 hours, it’d take ~1 kWh over the space of a day. We then divide it by person to give you a sense of the scale of the resource proportionate to the size of the population. Be sure to check out the methodology. For reference – we’ve been looking to replace around 55 kWh/d/p of energy currently generated by fossil fuels. Be sure to check out our treatment on road, air transport, home energy use and general consumption from the last few days. Author Oliver BrucePosted on November 13, 2012 Categories Climate business, Climate politics, Climate science, environment and ecologyTags energy, energy efficiency, renewable, sustainability4 Comments on Sustainable Energy NZ #15: Keeping it lean and mean – a summary of energy use. Remember, as before, the units are in kWh/day/person – ie. if you ran a 40W lightbulb for 24 hours, it’d take ~1 kWh over the space of a day. We then divide it by person to give you a sense of the scale of the resource proportionate to the size of the population. Be sure to check out the methodology. For reference – we’ve been looking to replace around 55 kWh/d/p of energy currently generated by fossil fuels. Farming and food processing cost about 8kWh/d/p of the NZ energy bill, much of which is of course exported. This is only energy consumed in food production – a great deal more energy is directly incorporated into our food from the sun. When looking at land for either biofuel or solar production, energy production competes directly with food. We could grow a lot more biofuel if we produced a lot less milk, for instance. For the purposes of national energy supply, we doubt much can be gained in terms of energy efficiency to support current production. New Zealanders eat more beef than the UK population, but we eat next to no grain-fed beef and barning is rare. 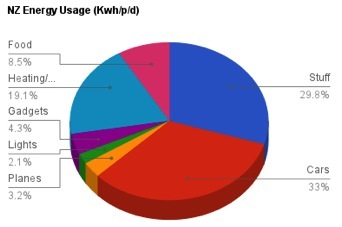 Overall, the 15kWh/d/p for a UK person is probably pretty similar here. Reduce that to 10 for vegans, but remember that crops cannot be grown on much of the land that we graze (especially not continuously). We covered the breakdown of where we use this energy in the last post. Today we’re dealing with commercial and residential building energy use. Be sure to check out our treatment on road and air transport from the last few days. A few notes before we begin: as before, the units are in kWh/day/person – ie. if you ran a 40W lightbulb for 24 hours, it’d take ~1 kWh over the space of a day. We then divide it by person to give you a sense of the scale of the resource proportionate to the size of the population. Be sure to check out the methodology. For reference – we’ve been looking to replace around 55 kWh/d/p of energy currently generated by fossil fuels. Making sense of the commercial and residential energy use in the Energy File is more complicated. All the commercial energy to light, heat, and power our gadgets both at home and at work amounts to 21.2kWh/d/p. Compare this with a UK usage of 37kWh/d/p for heating and cooling. A couple of caveats about these figures though. First, “industrial” energy use almost certainly includes some workplace heating, lighting and gadgets, so the real number is certainly higher. The number includes 5kWh/d/p of firewood but excludes firewood obtained from non-commercial sources. Using MacKay’s estimates as a rough guide, we would break this down as follows. Sustainable Energy NZ #12 – do Kiwis have to be flightless? It’s a very important topic – and one prone to greenwashing and hype. Like McKay, we want to have informed discussion about the options available to us here in NZ, so we’ll be going through topic by topic and looking at energy use in each sector of our lives: transport, residential energy, the things we buy, and so on. We hope that you find it interesting and informative. A few notes before we begin: as before, the units are in kWh/day/person – ie. if you ran a 40W lightbulb for 24 hours, it’d take ~1 kWh over the space of a day. We then divide it by person to give you a sense of the scale of the resource proportionate to the size of the population. Be sure to check out the methodology. For reference – we’re looking to replace around 55 kWh/d/p of energy currently generated by fossil fuels. The 2.6kWh/d/p spend on aviation fuel, from the Energy Data File, is a very poor indicator of what New Zealanders actually spend on planes, because of airline fuelling regimes. For example, the return flight from London is included in the UK statistics. Data from the UN [o96d7t] and the International Civil Aviation Authority [8cc3859] gives an estimate of NZ passenger kilometres in 2004. Dividing by 2004 population converts to 18kWh/d/p using MacKay’s estimate for fuel use. This includes energy spent overseas, and is a better indicator of New Zealanders’ actual energy use on air travel. Author Oliver BrucePosted on November 6, 2012 November 8, 2012 Categories Climate business, Climate politics, Climate science, environment and ecologyTags air travel, David MacKay, energy, energy efficiency, NZ, sustainability30 Comments on Sustainable Energy NZ #12 – do Kiwis have to be flightless?